As previewed last week by CEO Arnold Donald, Carnival Corp. officially launched a national multi-brand marketing initiative to promote its nine cruise brands on TV, the Internet and social media. Carnival is luring consumers in by offering a chance to win a free cruise every year for life. 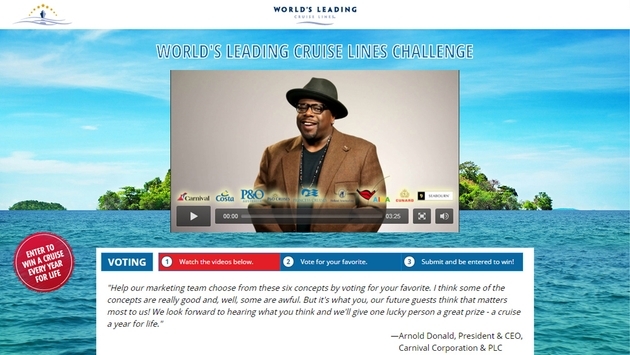 But the line also wants their opinions on cruising and asks them to vote for their favorite of six possible TV commercials. The campaign also invites past cruisers to tell others on Twitter what they like about seagoing vacations. Users tweeting @CarnivalPLC with the hashtag #LoveCruising will be eligible for free cruises as prizes, with one individual selected at random to receive 100 days of cruising. The marketing initiative is designed to attract more travelers who have never taken a cruise by highlighting the value and debunking misconceptions. The hub of the campaign — which does encourage consulting with a travel agent — is at www.WorldsLeadingCruiseLines.com. A fun aspect of the campaign is an online quiz to help first-timers determine their “Cruise-A-Nality” — or cruise personality. The interactive tool asks six questions to pinpoint from 30 personas, and then find out which Carnival Corp. brand is the best match. “Unicorn”: Unicorns missed Noah’s boat; false preconceived notions about cruising held them back. “Cruise Virgin”: These people tell consumers about their first time — which they will never forget. “No Robots”: Carnival’s cruise ships are free of hassles and obstacles like evil robots. “Message in a Bottle”: Fairytale moments of cruising from each of Carnival Corp.’s nine brands are in a message in a bottle. 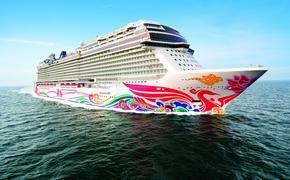 “Getaway”: Cruising give guests the chance to get away from all the stresses of life. “Mystery Spot”: This idea contains an undisclosed surprise that’s as big as the ocean. Carnival Corp. brands are Carnival Cruise Lines, Cunard, Holland America Line, Princess Cruises and Seabourn in the U.S.; AIDA Cruises in Germany; Costa Cruises in Italy; and P&O Cruises (Australia) and P&O Cruises (United Kingdom). They operate 101 ships totaling 214,000 lower berths.